The decision to launch the latest pan-European lottery was made in Amsterdam, with nine national lottery companies cooperating from the outset (compared to just three for the EuroMillions in 2004!). Seven more joined until February 2013. The cooperating countries have pooled together for a maximum payout of 134 million Dollars, and a respectable 14 million Dollars minimum. The EuroJackpot is the first major competitor to the EuroMillions lottery, which was launched way back in 2004. EuroMillions is still significantly larger than the EuroJackpot, with its maximum prize of 283 million Dollars. However, it is worth noting that the odds of winning the EuroJackpot are better than winning the EuroMillions; EuroMillions odds are worse than the EuroJackpot (1 in 95 million for the EuroJackpot, versus 1 in 117 million). 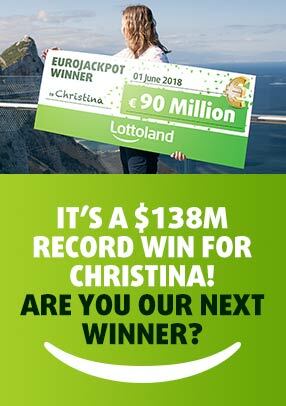 When can I participate in the EuroJackpot? The first EuroJackpot draw took place in March 2012. The EuroJackpot draw is now a regular event, with draws scheduled for every Friday evening. You can get your EuroJackpot ticket right here at Lottoland, and who knows, you might be the next EuroJackpot millionaire! Croatia, Czech Republic, Denmark, Germany, Estonia, Finland, Hungary, Iceland, Italy, Latvia, Lithuania, the Netherlands, Norway, Slovenia, Spain and Sweden participate in the EuroJackpot Lottery. The organisers of the EuroJackpot guarantee a minimum prize pool of 14 million Dollars. The maximum jackpot is set to a massive 134 million Dollars! How much does the EuroJackpot cost to play? One line (i.e. a completed box on the lottery ticket) costs 3 Dollars. The EuroMillions and EuroJackpot are actually pretty similar in terms of format: for the EuroMillions, one must choose 5 numbers out of a range of 1 to 50 plus 2 supplementary (Star) numbers between 1 to 12, while the EuroJackpot only has a supplementary number range between 1 to 10. This seemingly tiny difference has a huge impact on the odds of winning however; the probabilty to win the EuroJackpot is approximately twice as high. The cost for a EuroJackpot ticket is 3 Dollars, while the EuroMillions ticket costs 4.25 Dollars.